Saint Cecilia, Virgin and Martyr – Saint of the Day from "My Catholic Life!" The First Eucharistic Prayer, also known as the Roman Canon, is principally a liturgical document. But like so many things liturgical, it also has immense historical value. Only a tiny fraction of the ancient world’s documents have survived. Archives flood, libraries burn to ash, monasteries collapse, castles are sacked, and coastlines erode—the cities perched above them crumbling into the waves, everything lost, as the sea pushes inland. When documents disappear, historians must work from scraps of pottery and marble, from the detritus of watery shipwrecks, to gather just tiny pieces of the fuller mosaic of what once was. The Catholic Church is a phenomenal exception to culture’s progressive Alzheimer’s. In its law, catechisms, calendar, feasts, buildings, hierarchy, and most especially its liturgy, the Church’s past is never really past. Catholicism’s collective memory is stored, not in rack upon rack of digital servers in hermetically sealed rooms, but in the minds of its hundreds of millions of adherents. The faithful are the cloud. Priests and religious in particular circulate the living faith, ensuring that it is perpetually churning, flowing, and spreading like a living organism. The names of the martyrs listed in the Roman Canon include today’s saint, Cecilia. From one perspective, that is all we need to know. She lived. She was martyred. She was remembered. Cecilia’s name was included in the only Eucharistic Prayer then said at Sunday Mass, presumably because she stood out from the many other martyrs for a particular reason. That reason has been lost. Perhaps a stirring homily, committed to writing, preserved the details of Cecilia’s life and tragic death. But maybe that homily turned to ashes when the massive library of the monastery of Cluny was destroyed during the French religious conflicts of the 1500s. Perhaps there was a biographically detailed marble epitaph over Cecilia’s grave in the catacombs. Yet maybe it was wrenched from the wall by a barbarian looter who then used it as a doorstep at his house in Aachen. Cecilia’s details are lost, but the Roman Canon is not, and it groups for us some notable virgin martyrs of the first few centuries: “…Agatha, Lucy, Agnes, Cecilia, Anastasia…” Like flies in amber, their names are preserved, to be heard in hundreds of languages by millions of people every week until the end of time. A tradition holds that Cecilia was martyred by cuts to her neck after attempts to steam her to death were unsuccessful. She was then buried in a loculus near the papal crypt in the catacombs of Saint Callixtus. After being the object of devotion in the catacombs for centuries, Cecilia’s remains were transferred by the Pope in the early 800s to her own Basilica in the Trastevere neighborhood of Rome. During some restoration work on the Basilica in 1599, Cecilia’s body was uncovered and found to be incorrupt. Before contact with the atmosphere caused her fragile skin and bones to disintegrate, an artist carefully noted what he saw. His sculpture of Saint Cecilia is evocative and justly famous. The marble itself seems to rest in peace. It is not a forward, glorious pose in the Counter Reformation tradition. The marble is white, reflecting Cecilia’s purity. The saint’s face and hair are mysteriously covered by a sheet, inviting the mind to wonder. Cecilia’s fingers seem to form a cryptic Christian symbol of the Trinity—Three in One. And her neck is sliced by the stroke of an axe. The sculptor’s personal testimony is embedded in the floor near his work: “Behold the body of the Most Holy Virgin, Cecilia, whom I myself saw lying uncorrupt in her tomb. I have in this marble expressed for thee the same saint in the very same posture and body.” We don’t know the full story of our saint, but we are certain of her end—a generous act of self gift to Christ. 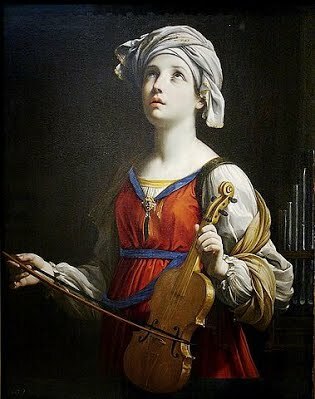 Saint Cecilia, you died an early death, preserving your virginity and choosing Christ over all others. Be an example to all youth of the true goal of their lives. Help them to seek God first and the good and holy pleasures of life only after Him.